Today [30th Apr 2016] is the 9th day of Sri Parthasarathi Swami special Brahmothsavam – Theerthavari. 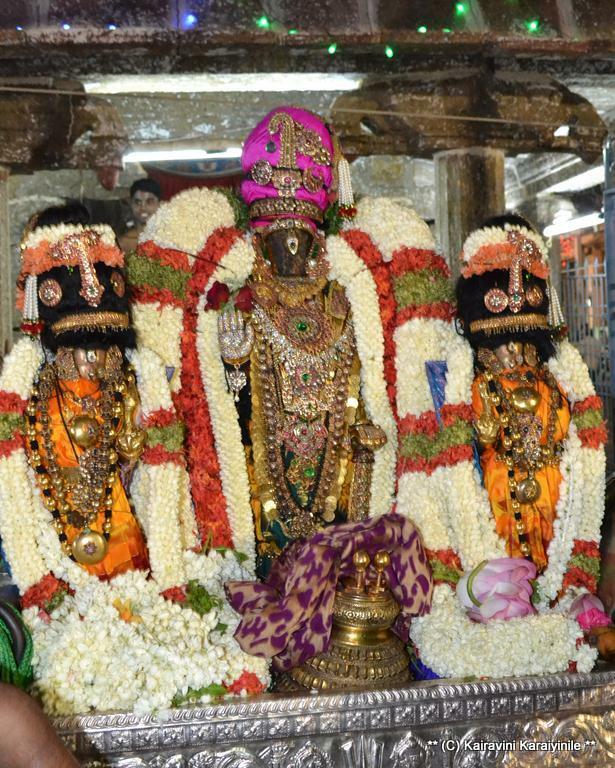 In the morning Sri Parthasarathi had purappadu in “Aaal mael pallakku”. Its significance is the symbolic search whence Perumal Himself comes incognito, covered with ‘sheets’ (போர்வைகள்). Today’s events are sequel to that of yesterday’s i.e., ‘Thirumangai Mannan Vaibhavam’; Emperuman turning Kaliyan into his astute devotee teaching him the ‘ashtakshara mantra’.... In symbolizing search of lost ring, Perumal has Himself covered with ‘sheets’ and comes incognito - the deed of His searching is celebrated at the same place where He gave the Ultimate advice to Thirumangai Mannan. 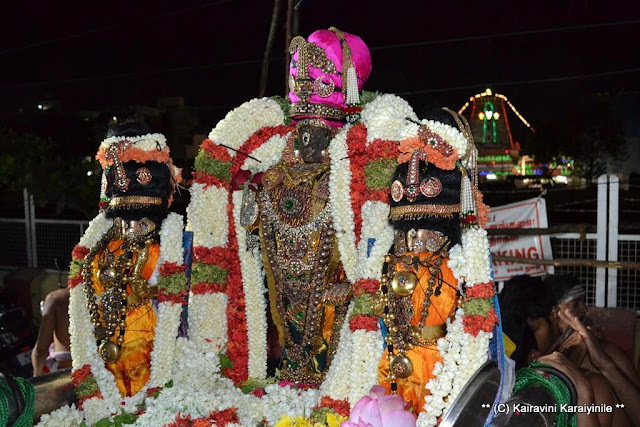 With every circling round, one porvai is removed and for a few seconds one can have darshan of Sri Parthasarathi with no floral garlands – then many flowers adorn Perumal. Upon reaching the Temple, the conflict with Ubaya Nachimar on His going out untold is enacted. ஸ்ரீபார்த்தசாரதி ஏழாம் நாள் உத்சவம் - திருத்தேர். 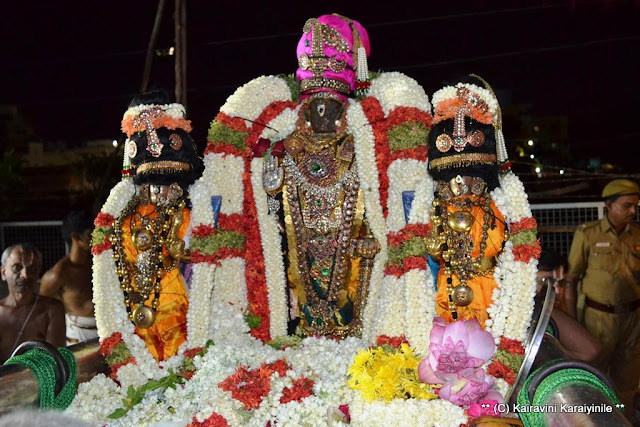 Thursday 28th Apr 2016 was day 7 of Sri Parthasarathi Chithirai Brahmothsavam – the grand Thiruther [chariot]…. After the grand Thiruther purappadu – thousands of devotees had darshan of Sri Parthasarathi seated in Unjal on the Thiruther. In the evening there was ‘pathi ulavuthal’ and purappadu till the eastern entrance in Sunkuwar Street on the Marina beach road. One of the few occasions whence Perumal has purappadu outside the precincts of Mada veethi and Kulakkarai. Later there was thirumanjanam at Andal Neeratta mandapam, facing eastern side now. Here are some photos of the thirumbugal Thiruther purappadu. Today, 28th April 2016 is day 7 of Sri Parthasarathi Brahmothsavam – the grand Thiruther [chariot]….. one will realise its grandeur, if one were to stand near as the 8 or 9 feet wheel rotates by. Thiruther is a grand occasion of togetherness of people. During Brahmothsavam thousands throng Temple and have darshan of Perumal in His veethi purappadu ~ significantly, during Thiruther, thousands partake – they pull, go around, push, offer buttermilk and panakam [jaggery water] to devotees and there is celebrations on the air, clearly visible. On screen too, we have seen many – one got enamoured by the scene of Arjuna wading through the forces in Mahabaratha - even those chariots were quite attractive. Ratha is not only fleet-footed mode during war, it symbolizes energy and zeal to move forward. It was on the chariot steered by Lord Krishna, Geethopadesam occurred to Arjuna, the mighty warrior. The rath itself according to legend was given by Agni. Odisha’s king Narshimhadeva, the first of Eastern Ganga dynasty, decided to make a huge temple complex consisting of four temples dedicated to the Sun god in 1255 AD. The site chosen by the architects was in the north-eastern corner of Puri, one of the four sacred dhams – Konarak, Bhubaneswar. The Konark temple is designed in the form of the chariot of the Sun god. It has 24 wheels and seven horses. In the Himalayas, Buṅga Dyaḥ Jātrā is a chariot procession honouring the deity of compassion. Rato Machhendranath chariot festival is held according to the lunar calendar in Nepal. The ratha is made at Pulchowk by the Barahi and Yawal clans, amongst which one only does the rope work and other only the wood work. In the construction of the chariot no nails are used to connect the joints of the huge chariot but are only tied with ropes, excepting wheels hold. 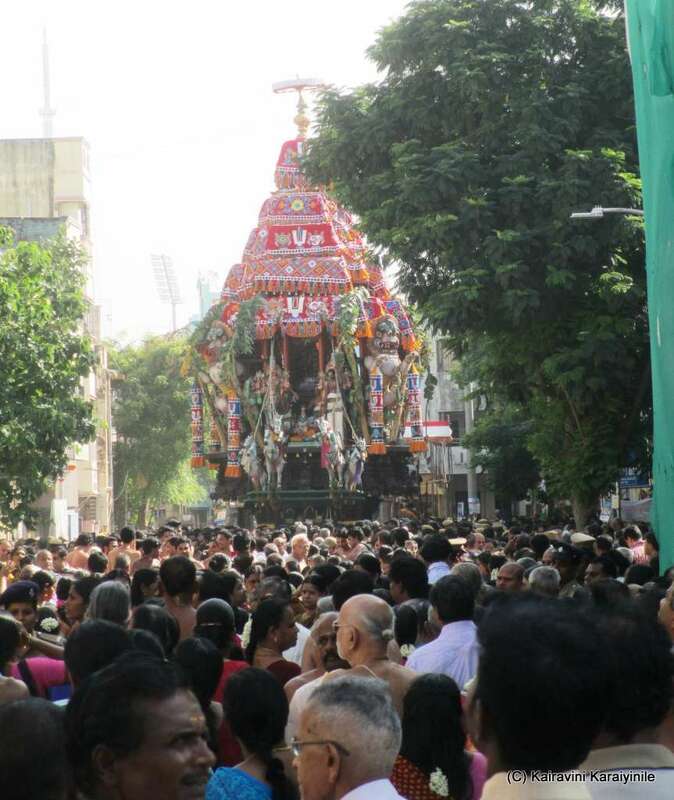 It was a grand festive day at Thiruvallikkeni Divyadesam – the chariot was pulled at 07.30 am and reached back the place by 08.45 am ~ it was heavenly. திருவல்லிக்கேணியில் சிறப்புற நடைபெறும் ப்ரம்மோத்சவத்தில் இன்று ஆறாம்நாள் ~சூர்ணாபிஷேகம் உத்சவம் . இன்று [27th Apr 2016] காலை ஸ்ரீபார்த்தசாரதி அழகு பொலிந்திட தங்கசப்பரத்தில் புறப்பாடு கண்டு அருளினார். 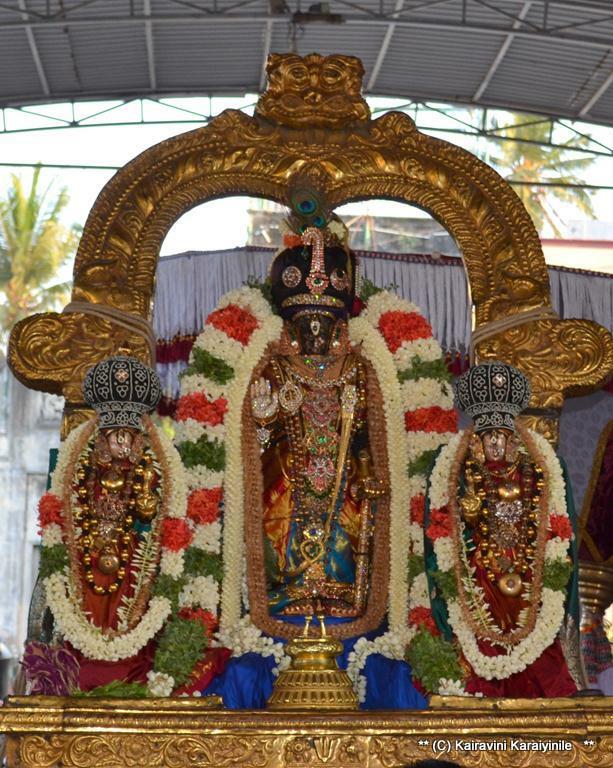 Today is the 6th day of Brahmothsavam at Thiruvallikkeni Divyadesam for Sri Parthasarathi. This morning after ‘Choornabishekam’, Sri Parthasarathi had purappadu in ‘Punniya Kodi vimanam’. In the purappadu, ‘Thiruchanda Virutham’ composed by Sri Thirumazhisai Azhwaar was rendered. These 120 songs fall under the type ‘virutha paa’ – they are replete with numbers and fall under a specialized category of tamil grammar called ‘enn adukki cheyyul’. Some photos taken during the morning purappadu are here. The chapparam is tall and imposing and has been in existence for decades – not sure how much of engineering went into measuring its height – one wondered, as it entered Gangai kondan mandapam with ease – inches separating the roof and the kalasam. ~ this is what you see … and so much happens prior to that !! 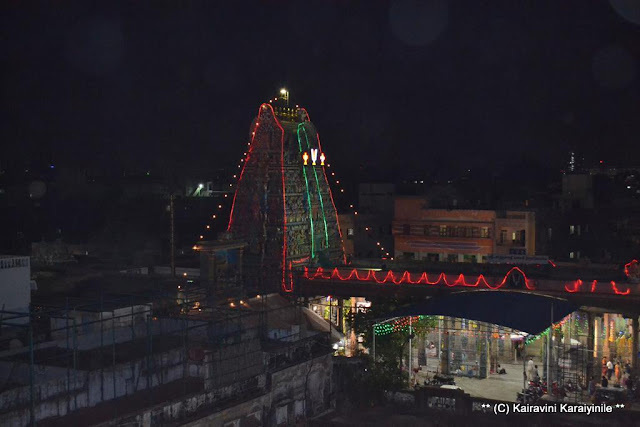 Thursday 28th Apr 2016 is day 7 of Sri Parthasarathi Chithirai Brahmothsavam – the grand Thiruther [chariot]….. one will realise its grandeur, if one were to have a glimpse from nearer as the 8 or 9 feet wheel rotates by. It is awesome, as people say. Thiruther is a grand occasion of togetherness of people. Come to Thiruvallikkeni in the morning around 0630 am and have darshan of Emperuman in Thiruther. Lot of work goes to making the Thiruther look so grand ~ this morning, as I passed by – Sripadhamthangigal were at work, getting the ‘horses for courses’ – laudable indeed ! Sri Parthasarathi Swami Chithirai Brahmothsavam is on and today – 25th Apr 2o16 is day 4 – in the morning it was Surya Prabhai ~ the Sun is the most important. The Sun’s illumination is the ultimate energy source for the Earth's biosphere, and the ultimate driving force for atmospheric, and oceanic circulations. Without the Sun, the Earth would be no more than a frozen rock stranded in space. The Sun warms the Earth and makes life possible. It’s energy generates clouds, cleanses our water, produces plants, keeps animals and humans warm, and drives ocean currents and thunderstorms. Despite the Sun’s importance, until a few decades ago, astronomers and Earth scientists did not even have accurate data on the total amount of energy from the Sun that reaches the Earth’s outermost atmosphere. Our ancient scriptures have always held Sun and its rays of prime importance. Adiyta (Sanskrit) means "of Aditi", referring to the offspring of Aditi. Scientifically, the Sun is a star, a hot ball of glowing gases at the heart of our solar system. Its influence extends far beyond the orbits of distant Neptune and Pluto. Without the sun's intense energy and heat, there would be no life on Earth. And though it is special to us, there are billions of stars like our sun scattered across the Milky Way galaxy. The average diameter of the Sun is - : 864,000 miles, about 109 times the size of the Earth. Virtually all life on Earth depends on the sun for energy. Although it appears constant, the total amount of energy radiated by the sun is constantly changing, on scales of seconds, to years, to centuries. that when we do kainkaryam to Lord (to Him at Thiruvenkadam), we must do service by being with HIM throughout our life and do as a slave would serve his master. 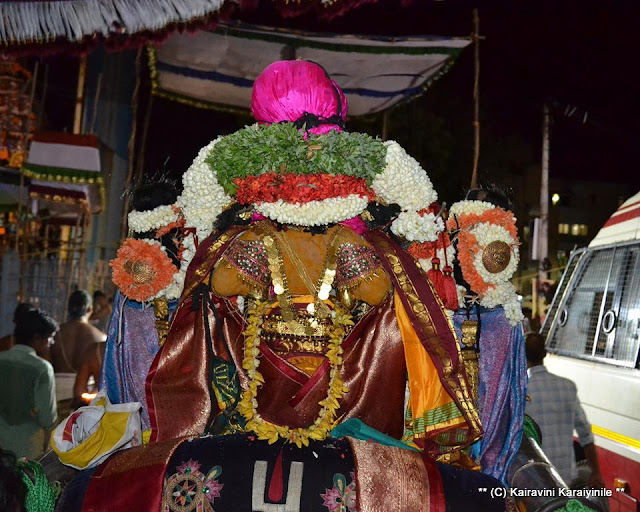 The Chithirai Brahmothsavam of Sri Parthasarathi is now on, and today is day 4 – Hamsa vahanam, one of the heaviest of the vahanas, thus making it more difficult to be carried on shoulders. In Divyadesams, there are dedicated groups of people who render soul-stirring service to Lord, thinking of nothing else – there are the Battars; Veda, Divyaprabandha goshti, people doing service in many manner and there are Sripadham thangigal, who carry the Lord on various vahanas. Sripadham literally is the divine Lotus feet of Sriman Narayana and it is our fortune to be associated with the Lord, touching His divine feet – to which ultimately all of us surrender. 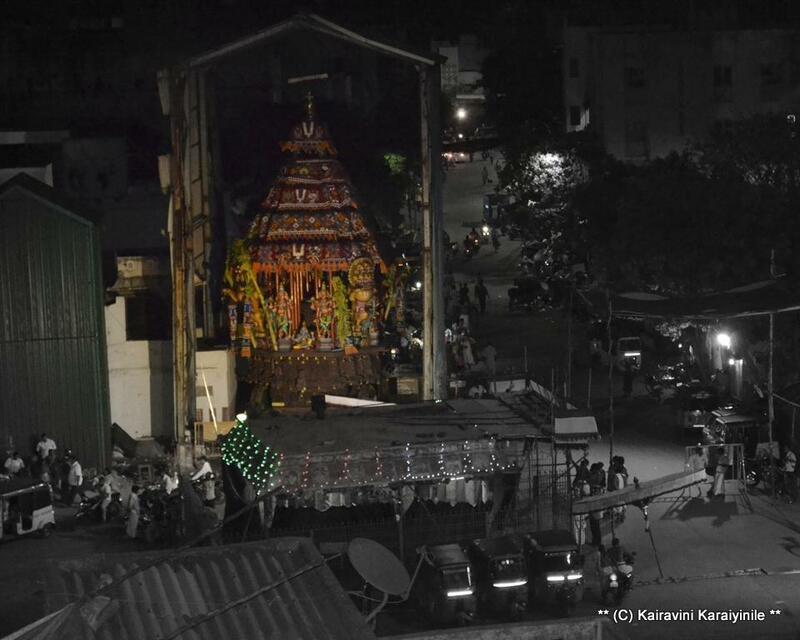 Uthsavams are celebrations ~ and Brahmothsavam is celebration on a grand scale. People happily worship Lord in the streets, standing in front of the houses – have heard that in olden days, those elders so attached to the Lord would move a few distance alongwith the Lord, literally following Him. At Thiruvallikkeni, the brahmothsava purappadu takes hours and naturally, it is tiresome physically, not in mind for all involved. For the kainkaryabarars, like Sripadhamthangigal, their involvement starts hours before the actual purappadu and ends much after Perumal’s vahanam descends at Vahana mantapam and Perumal returns to the Temple. Not all would know there is more … it is not only present, but – after the purappadu, the vahanam needs to go back to its place … and strategically, the vahanam for the next purappadu is readied – the evening purappadu would end in dead of night and the morning purappadu would start early morning and hence the work – here, are a couple of photos of Thennacharya Srivaishnava Sripadham Thangigal of Thiruvallikkeni, getting the Surya prabhai prepared for the morning, even as Hamsa vahana purappadu is on. There is never a dull movement in Triplicane, nor worry for the future – there is secondline of youngsters waiting in the wings all the time and this photo would say that all.